Yikes! Summer’s only a month away so we thought that was enough of an excuse to hit the stores and see what’s new and intriguing in fancy shoes and totes. We took one of our mini-jaunts this week and came up with a few items that caught The Eye and might captivate yours. The first display that stopped us cold was a table of Kate Spade handbags…brightly colored…so cheerful…but there was one star tote featured above with the perfect message if you’re as curious as we are. It will set you back $248. 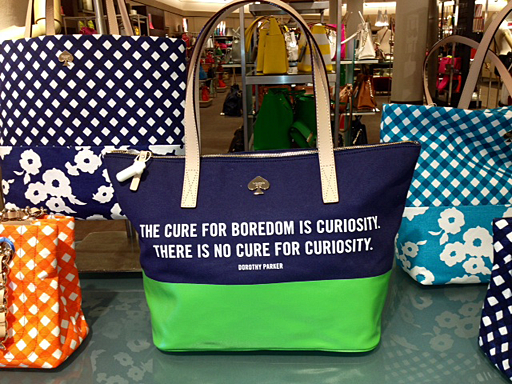 but this blue and green satchel featuring one of Dorothy Parker’s most memorable quotes will not soon be forgotten. The shoe department was next, of course. Were there any new trends, new colors, new heights we hadn’t seen before? We were not disappointed with the latest array of foot coverings. Fashion statements they were. Take a look at these crazy sneakers? running shoes? or neon tennis? Turns out you can bike and run in these Dynamic Duomax sneakers with open mesh that come in just about every neon color of the rainbow. When it comes to heels, we wondered whether they were escalating or deescalating. Here’s what we found. They were still stilty like these Isolá sandals with triple platforms in orchid purple with matching bows. That’s a 4 3/4 inch heel below. Pretty high and pretty snazzy!!! These were just the beginning of the day’s colorful array. How about these Børn blue wedgies? At $89, the price recommends. 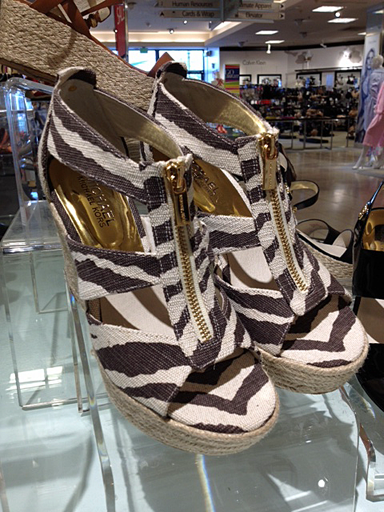 One of the newest additions to footwear is the zipper as you can see in these Michael Kors espadrilles. Easy on—easy off and very pleasing to The Eye in a casual kind of way. We leave you with a show-stopping wonder although there was lots more for The Eye to feast on for a future story. This high-top is certain to be a conversation piece. 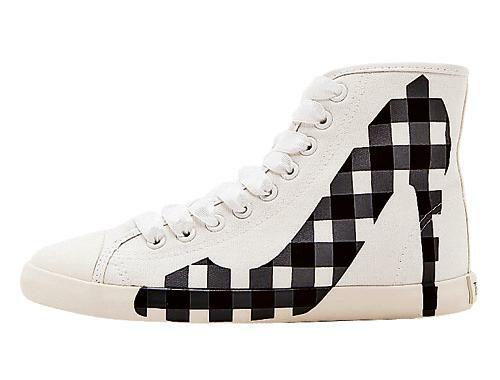 It’s a Be & D canvas sneaker with a stiletto pump silk screen print on the side. And it comes in a wide selection of shoe images and colors. At $98, you might say two for the price of one. FUN STUFF: Patent Leather is Back with a New Attitude! It’s been awhile since we’ve been inspired to report on a new development in fancy footwear. 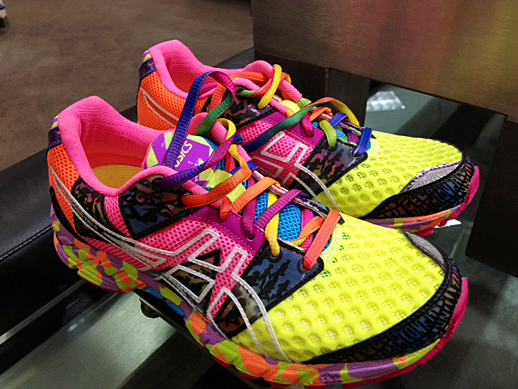 Every day there’s a more over-the-top shoe to review. It takes a pretty startling photo to get us excited about the latest design. Just when we think we’ve seen it all, along comes an incredible creation that causes us to run to the keyboard. This Gianmarco Lorenzi masterpiece is just that shoe. 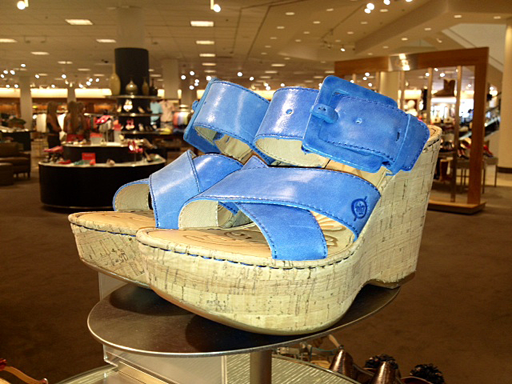 It’s taller than tall, features an amazing array of bright colors, and to top it off, is made of patent leather! This pink and purple pump has a peep toe and features contrasting florescent yellow insole. 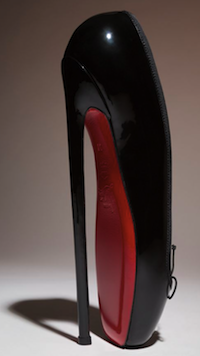 The blue stiletto heel is 16 centimetres tall. After careful calculation, that would be 6 1/2 inches in length. The wedge alone is 7 or 2 and 3/4 inches. That seems mighty tall to me. Oh, and the cost. If you guessed $816.57, you would be exactly right. Yes, pricey to say the least…but you have to admit, that’s a lot of shoe. in height anyway. 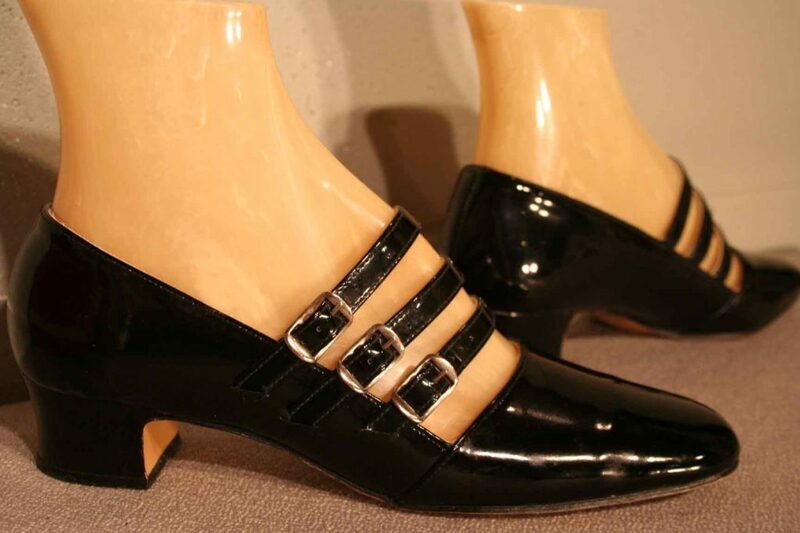 It got me thinking about patent leather shoes and how popular they once were. They were shiny, usually black, and thought to be the cause of certain reflections as the famous 70s book by John Powers* suggested. Take a look at these vintage 60s-70ish 3-strap Mary Janes with clunky heel. The asking price on Ebay–$65! 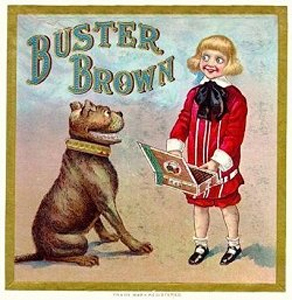 Classic Mary Janes were often made in patent leather and were named after the sweetheart of Buster Brown in the famous comic strip that began in 1902. We’ve come a long way in shoe design since then but, in a roundabout way, we can trace our passion for patent to this little girl character created at the turn of the century. For those who love shiny shoes, who can resist Gianmarco’s (@GMLorenzi) tall sculpted platforms or the simple glossy foot covers of Mary Jane. Each is a sight to behold! FUN STUFF: Shoe Obsession–Shoes, Shoes and More Shoes! 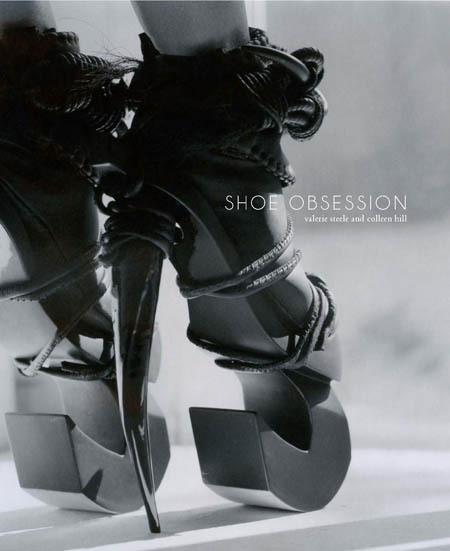 UPDATE 4/12/13–Shoe Obsesion exhibit is at FIT until April 13, 2013. 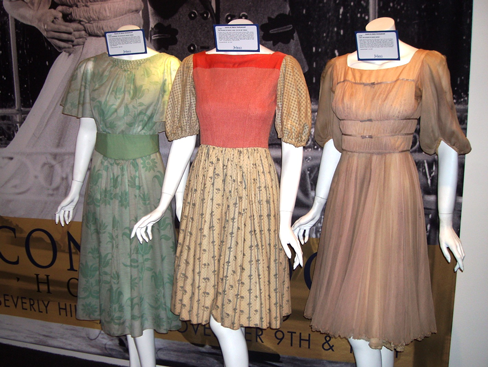 The stars were out en masse at The Museum at the Fashion Institute of Technology (@museumatFIT) in New York City recently. Names like Blahnik, Louboutin, Vivier and Kirkwood beamed, twinkled, stood tall and even shocked some viewers!! Up-and-comers like Charline De Luca were there as well! The stars were shoes–all 150 pairs of them! I must admit trotting in with my studded black suede clogs humbled me in this stratosphere of design. However, it did not deter me from thoroughly enjoying mingling with the “stars,” the guests and fashionably perfect curators. 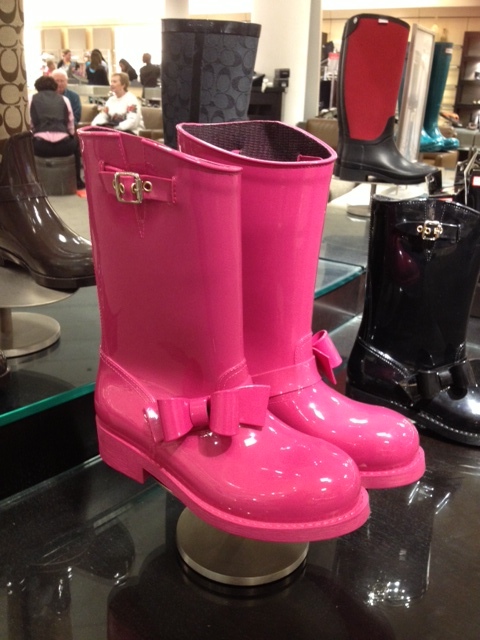 The reality is that there are shoes and then there are….. SHOES!!! Function has moved to fascination and now to SHOE OBSESSION, the title of this amazing collection of footwear. 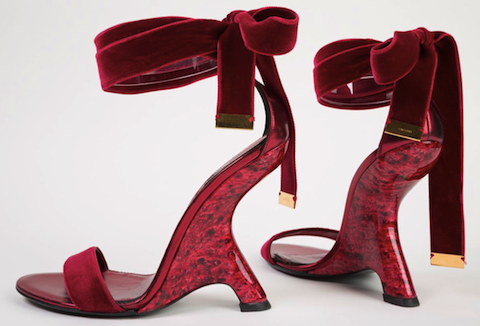 Museum Director and Chief Curator Dr. Valerie Steele and Assistant Curator of Accessories Colleen Hill drew on the last 10-12 years to exhibit some of the most beautiful and interesting modern shoe designs. 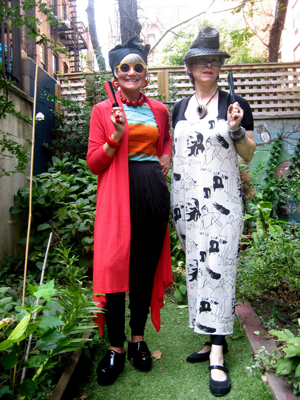 They also wrote essays for the like-titled book, SHOE OBSESSION, published by Yale University Press,which captures the 21st century shoe styles. Royalties from the sales will benefit the Fashion Institute of Technology (FIT). In a darkened room, the designers’ shoes were spotlighted in rows of tall glass tower columns. 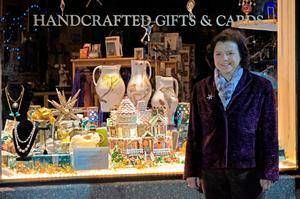 Guests meandered through the corridors of showcases smiling, oohing and ahhhing. Overheard were some quizzical hmmms. Some of the shoes were from the designers themselves; others were from private collections. The highest heel belonged to Noritaka Tatehana’s Lady Pointe Shoes with 18″ platforms. Those were most talked about along with Louboutin’s Fetish shoes. 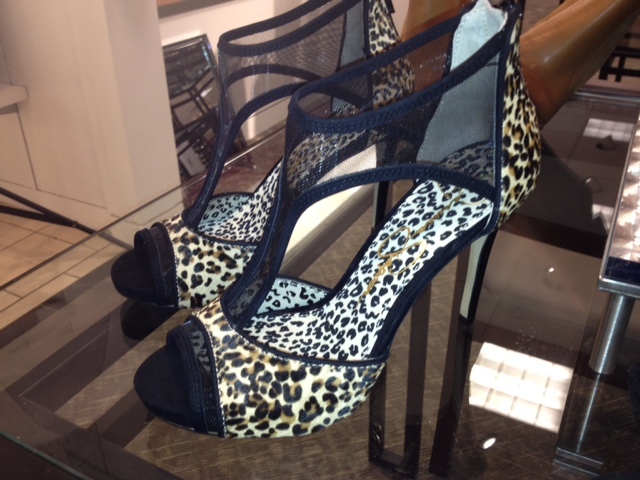 According to Dr. Steele, women shop for shoes that express their personality. Shoes are central to fashion, not just accessories. They are the main story. And, just within the last ten years they found the average American woman owns 20 pairs of shoes, double what it was 20 years ago. In a totally informal survey of ten friends, I indeed found they all had at least 20 pairs of shoes, including sneakers and boots, of course. 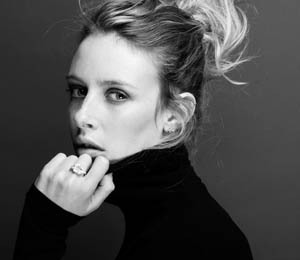 Charline De Luca, one of the up and coming shoe designers from Rome, Italy, says her high heels and sleek look are a signature. 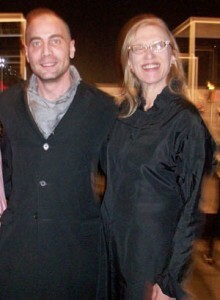 She was an architect, working for Fendi before being encouraged to pursue shoe design. Charline is inspired by the art world, thinking about new collections every day and even taking notes on napkins when she’s out to lunch. She loves the linear, clean and the feminine look created by Chanel. When I asked Colleen Hill about the soaring heights, diverse materials and avant-garde shapes, she said that the modern designs are “all about experimentation. The increased popularity of shoes has allowed for that.” As far as the high, sky high heel, designers seem to be paying homage to history. “High heels are the prime sartorial symbol of femininity,” she added. The fun fact I learned was that probably the most knocked off, imitated designer is Louboutin–the platforms, the very high heels and of course the red sole and embellishments. The idea of unique shoes popping up for the Fun Stuff column on TWE is nothing new, but this exhibit certainly showcases an extraordinary collection of shoe designs beyond some of our wildest imagination. 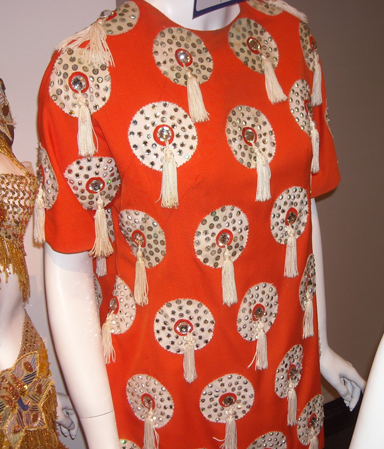 This fascinating Museum at FIT was founded in 1967 and is one of a very few museums in the world devoted to the art of fashion. It now has 50,000 garments and accessories from the 18th century to present day as well as textiles and other fashion related items. The Mission Statement states that the Museum serves as a “think tank for scholarly publication, new initiatives, and research opportunities for students, scholars and designers.” We can’t wait to come back and be inspired by future exhibits. 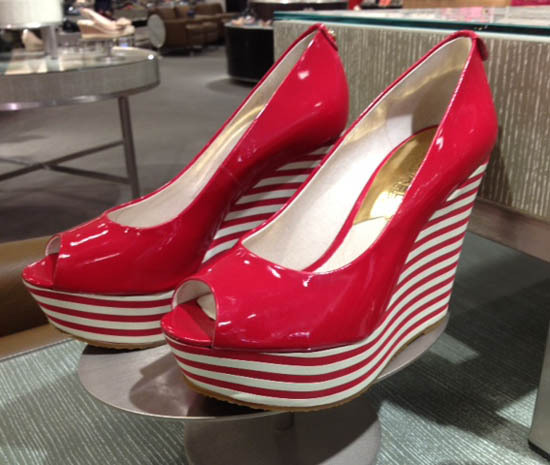 The Shoe Obsession exhibit will be at the museum through April 13th. Admission is free. Shoe Obsession, the book, will be available in April, 2013. 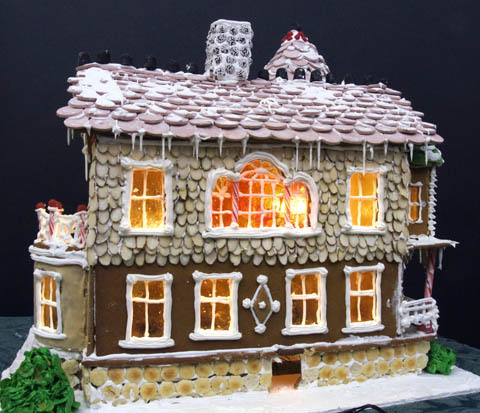 FUN STUFF: Eco-Friendly Gingerbread House Wins National Trophy! Along with snappy shoes and hats with flair, we have another favorite for Fun Stuff. This is no piece of clothing but something so deliciously special that it has to be saluted, especially during this holiday season. 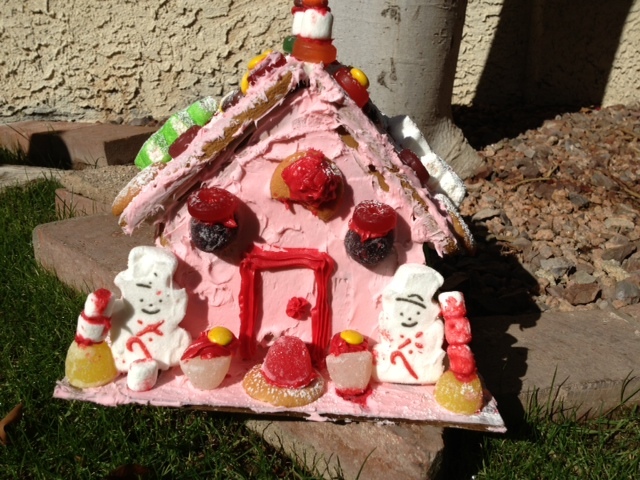 It’s a gingerbread house, but not just any candy-covered dwelling. This special house spotted on the TODAY Show this week is green! 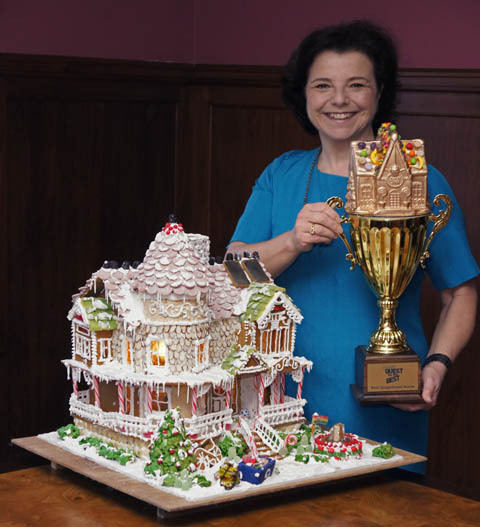 Carefully crafted by Laura Morrissette of Arlington, MA, the tasty cottage took first place in the NBC program’s National Gingerbread Contest. After making it into the contest’s top three houses, final judgement went to famous chef and restauranteur Hans Röckenwagner who declared it the national winner. 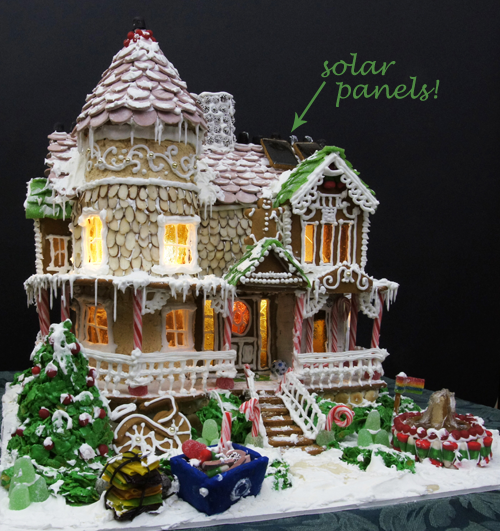 You ask how a gingerbread house could be eco-friendly? Laura was inspired when someone asked her why she didn’t put solar panels on her creations. 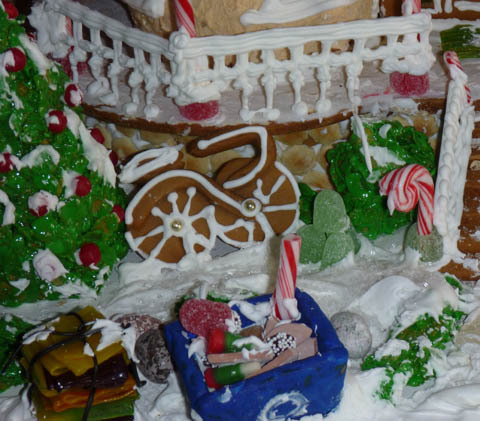 That seemed like a great idea so she designed this one with licorice panels on the roof, a recycling bin in the front yard, candy bottles carefully sorted from stacks of paper made of Fruit Roll-Ups and, for public transportation, a gingerbread bike. I couldn’t resist asking Laura who’s had over 25 years of gingerbread-making experience for advice to help frustrated builders like myself who can’t get gingerbread walls to stick together (don’t they always collapse?). She explained that it’s all about soup cans, egg whites, corn syrup and more. “Plan on several days of a mess in the kitchen,” she says. If you’re doing something elaborate, her advice is to plan it out on posterboard first. Another tip…use flat cookie sheets lined with waxed paper when baking the dough so it won’t stick. If it turns out wobbly, as most pieces do, straighten them out with a wood file. But most importantly, make Royal Icing. That’s what binds it all together. It’s a standard pastry shop item made up of egg whites, confectionery sugar and creme of tartar. You can find the recipe in any cookbook. And an even more important tip? Use soup cans on each side when building it. That way the walls won’t tumble over. Laura’s generosity of heart shines through in this award-winning home. She made it as a raffle item for Erica Manalang, the former owner of the store which became the Artful Heart gallery in Arlington Center a year ago. She had become ill and the new owner, Carla Dorato, wanted to raise funds for her and her family. Laura pitched in and created this special house in 40-50 hours. It sits in the shop’s window to be auctioned off soon. Laura reminded me that a gingerbread house doesn’t have to be fancy. It can be just a simple home with a flat roof. Even when hers were crooked, she thought they looked great. Or, maybe you want to go green this holiday season, but don’t forget the soup cans. Thanks for all the tips, Laura. We’re about to mix up some Royal Icing! We’ve been ogling the higher than high heels so fashionable these days and were wondering what the next trend in footwear might be. Certainly they can’t get taller (maybe!) but can they get fancier? Yes, from what we’re seeing they are getting flashier and sparklier. Whether the cost is little or lots, glitter abounds! If the above multi-colored Electraa with a 5 and 1/4 inch heel and a modest $59.99 pricetag isn’t glittery enough, there is always the Neptune! 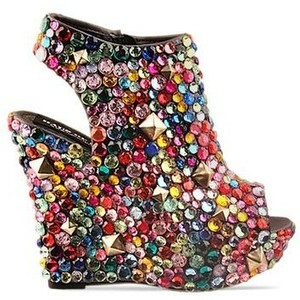 This handmade gem-encrusted wedge (left), or Mega Bootie as it’s called, has an open toe and heel cutout. This blinged out item lists for $354.95 at solestruck.com. 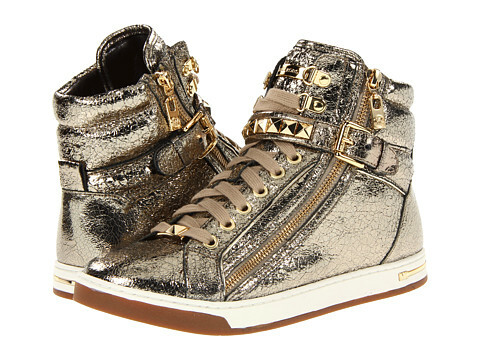 Now if you’re looking for something more comfortable, perhaps for walking but still with a lot of pizazz, take a gander at a new fancy “high-top.” It’s Michael Kors Glam Studded metallic leather sport shoe. This champagne-colored wonder even has “golden” hardware and prices out at $195. 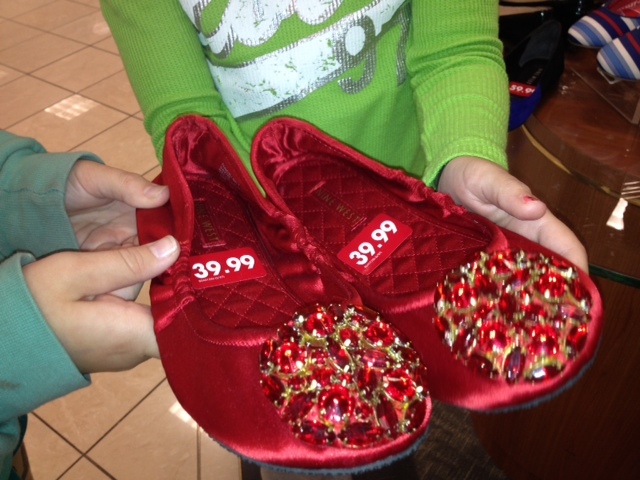 This current flash for the feet could be a sign that the holidays are coming and things that sparkle are festive and fun. If you’re in the mood to be bejeweled and bedecked with shoes that are showstoppers, you’ll find plenty of them on the internet in the coming weeks. As you know we’re always on the look-out for Fun Stuff, so send us an email if you stumble upon something that makes your eyes widen with awe and delight. In case you want to see how you could walk in those Multi-Heavy Glitter Blink Electraa Heels, here’s a brief demo. 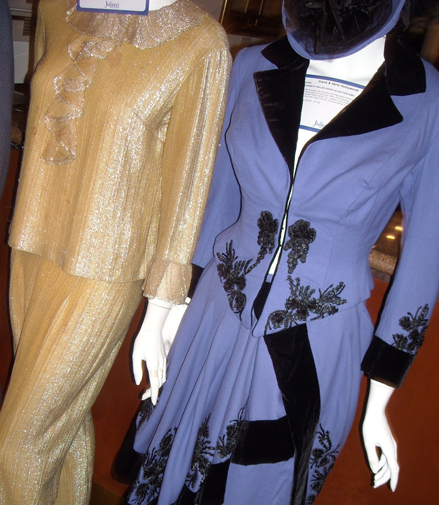 Fun Stuff: Iconic Dorothy Dress Sold for $480,000! In the movie classic, “The Wizard of Oz,” Dorothy uttered that famous phrase: “There’s no place like home.” Well, now Dorothy’s iconic blue-checkered gingham dress has found a new home. 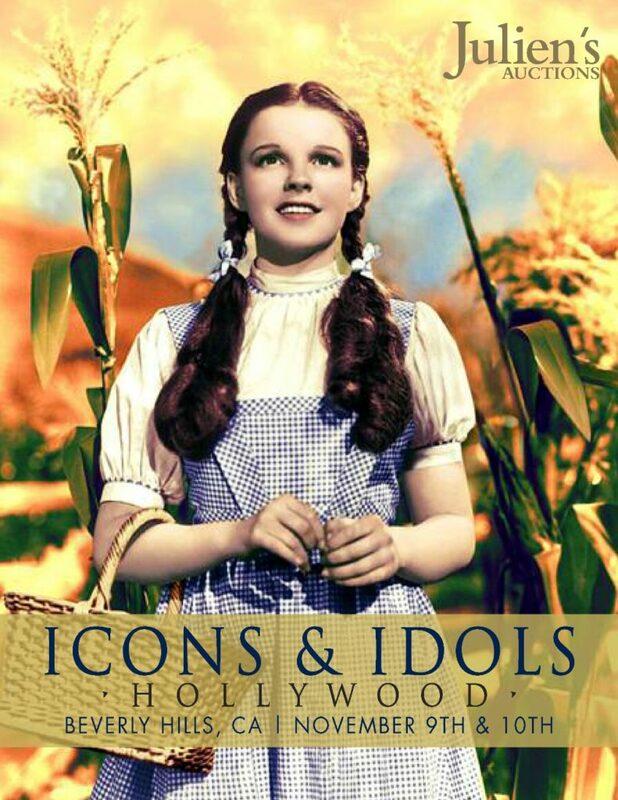 The costume, worn by actress Judy Garland when she played Dorothy Gale in the 1939 motion picture, sold on the auction block for $480,000!!! 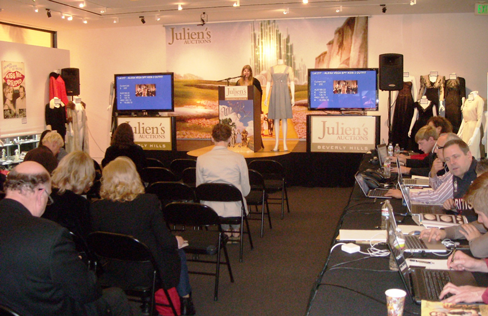 It was the marquis item up for bid at Julien’s Auctions’ “Icons and Idols” two-day auction held this weekend in Beverly Hills, CA. 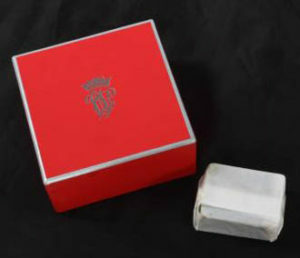 The auction even included cake from the royal weddings. Prince Charles and Princess Diana’s went for $1,375 while Prince William and Kate Middleton’s sold well over the estimate at $7,500. The video above will tell you more about this specially designed pinafore. There’s even a secret compartment in a seam that few people know about. 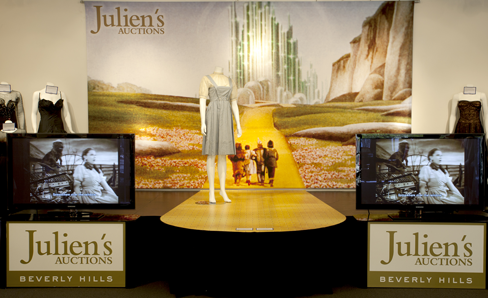 A New Jersey man bought it at auction for $2,090 in 1981 as a Christmas gift for his Oz-loving wife. But after thirty years, the couple made the emotional decision to let go of it and watched in person as it sold to the highest bidder. 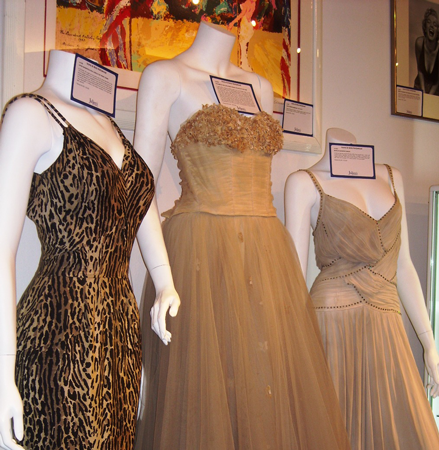 The dress was one of over 800 pieces of Hollywood history up for bid. My movie-loving life flashed right in front of my eyes. If I were a bidding kind of gal, I would have been all over Jayne Mansfield’s silk animal print dress (below). 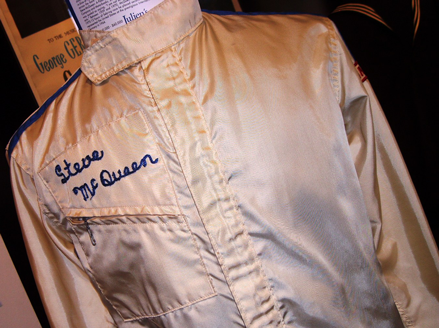 And Steve McQueen’s racing jacket worn in 1970 sold for a whopping $50,000!